Well as usual I am super excited to share yet another one of our reveals... This one in particular was major renovation - right down to the studs in fact! We partnered with Lyons Construction on this one and magic happened. We literally took down all the walls and started over, not much was left on the main floor from the original design! I wish I had some before pictures to share with you as the transformation is truly a dramatic one! When designing a space for clients I always take into account their lifestyle and how the space will be used. These clients in particular are a family of four but are always entertaining family and friends. They often have large crowds for dinner and visits, so I knew the space had to reflect that. They also wanted an open, warm and inviting space which I think we knocked out of the park. So lets start with the front foyer, we elongated an existing wall and removed the others to create a distinct entry way but still keep the space feeling open and airy. 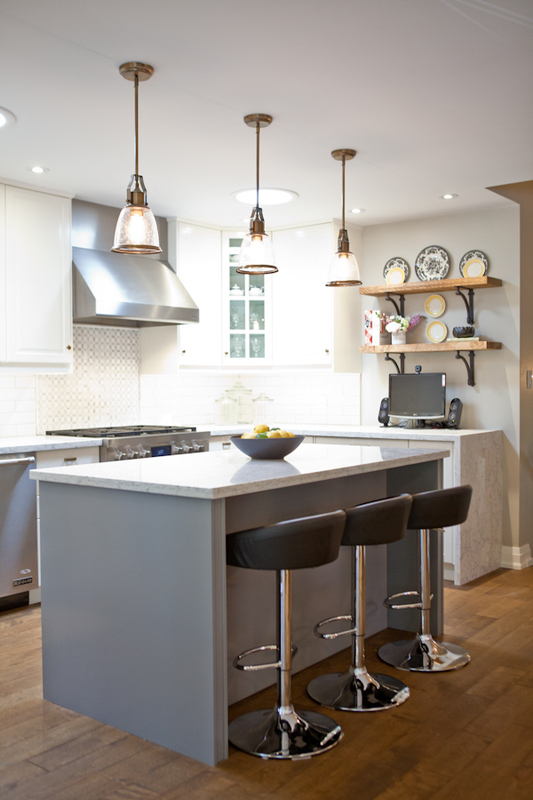 I chose a porcelain tile in a greige colour which adds depth, warmth and texture to the space. We updated the closet doors to wood and added mirrored panels to reflect the light. I also added a bench and an open shelf for much needed storage. 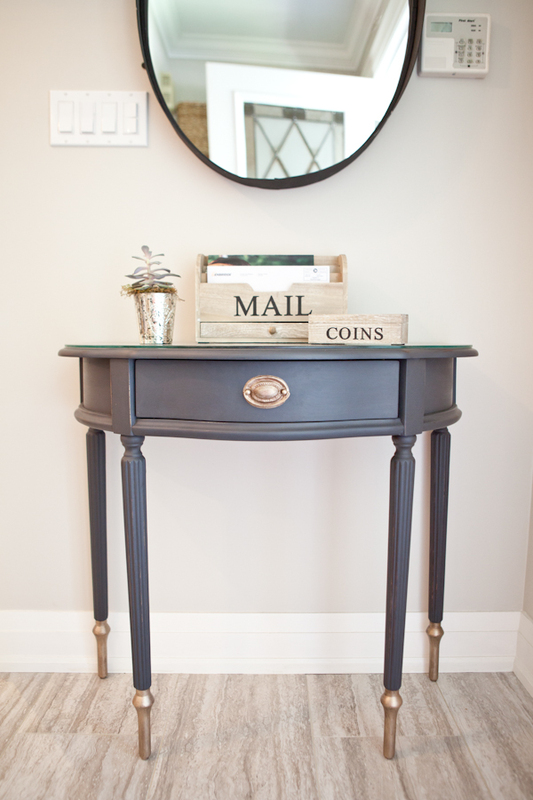 We had mango reclaimed update an existing front hall table in a soft black color and dipped the legs in a metallic antique brass to finish it off. 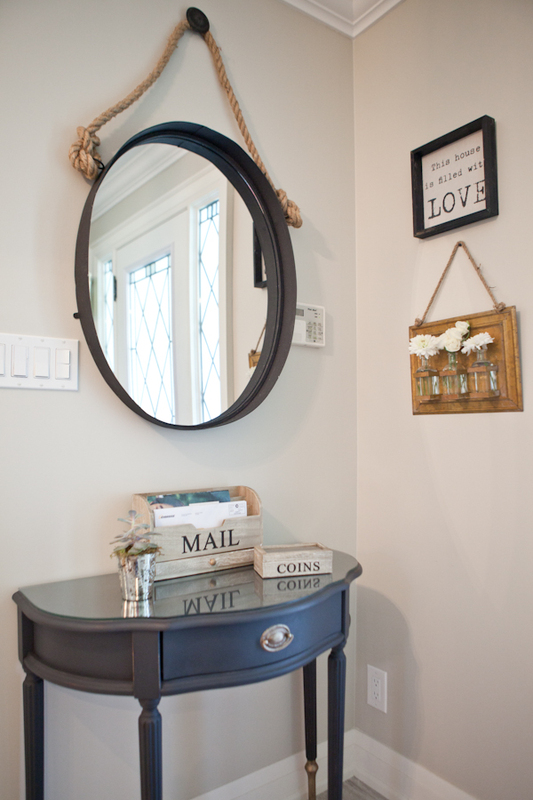 We added a roped mirror and some accessories to pull it all together. I think the front entry way is now functional and the perfect spot to greet guests ! Lets start with the fabulous kitchen as it always the heart of every home! We went with Ikea cabinets as they are great alternative to custom. 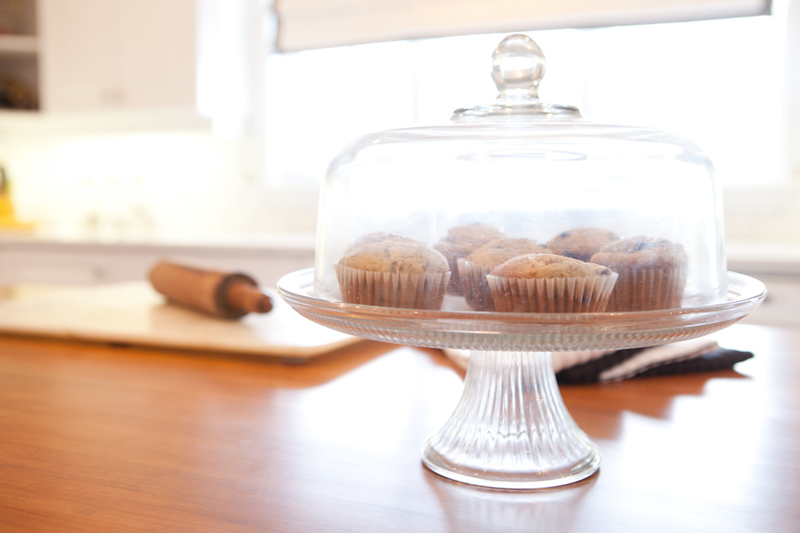 We choose a great shaker style cabinet in warm white and then added a large island in a soft warm grey. We used an LG countertop that mimics the look of a warm marble however gives them the durability they need in a workhorse kitchen. 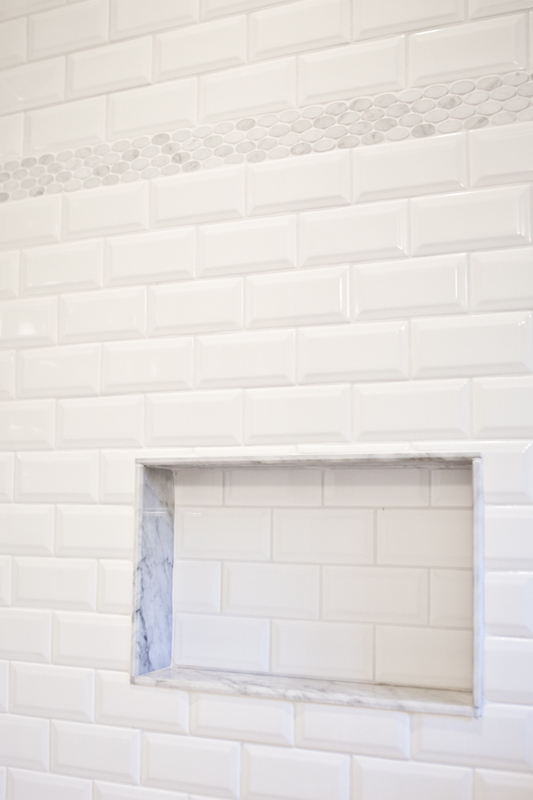 We then went with a extra large beveled edge subway tile and a gorgeous marble mosaic feature wall behind the new stove. 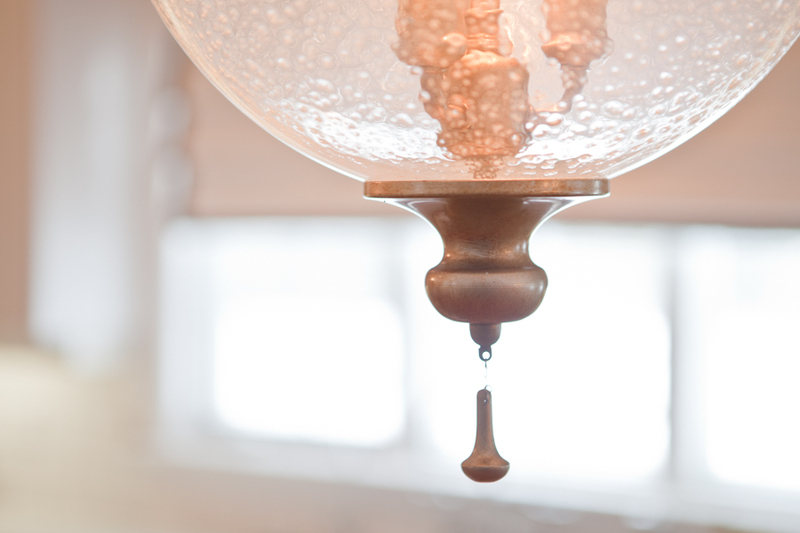 I then decided to kick it up a notch and go with some antique brass hardware and beautiful antique brass and glass pendants which just pull everything together. We chose brand new Jenn air appliances that are not only fantastic to look at but also gives them lots of cooktop and oven space to host all of their dinner parties. 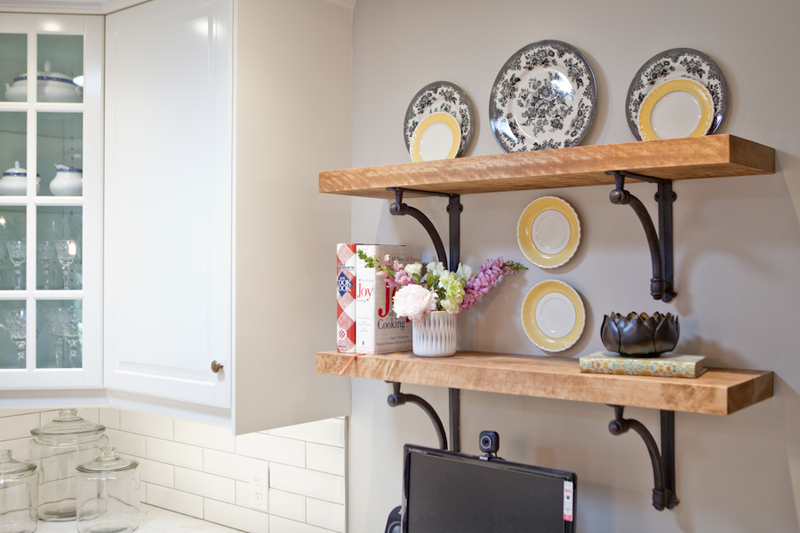 I also had some custom shelving made and had them stained to reflect the rustic flooring, they really add some texture and warmth to the light and airy kitchen. I wanted to give them a lot of space for entertaining so I chose an extra large sectional and a couple of low arm tufted chairs in a oatmeal toned fabric. We used golden rod yellow and a soft blue grey as accent colours in the space, we also added pops of soft black and antique brass. You will see this carried out in the fabric of the throw pillows, paint, drapery and accents in the space. 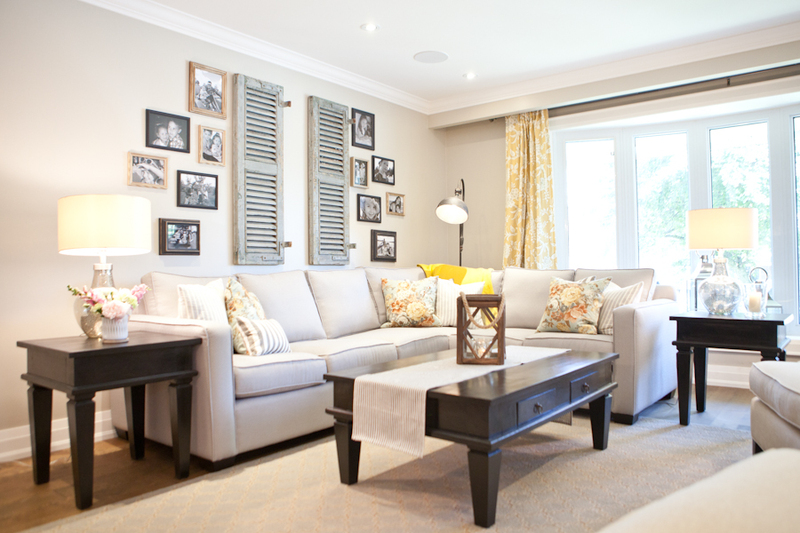 I think one of my favourite things in the space is the gorgeous custom gallery wall we created behind the sofa. I took black and white family photos and had Mango Reclaimed restyle some vintage frames in black and metallic brass and the result is stunning. 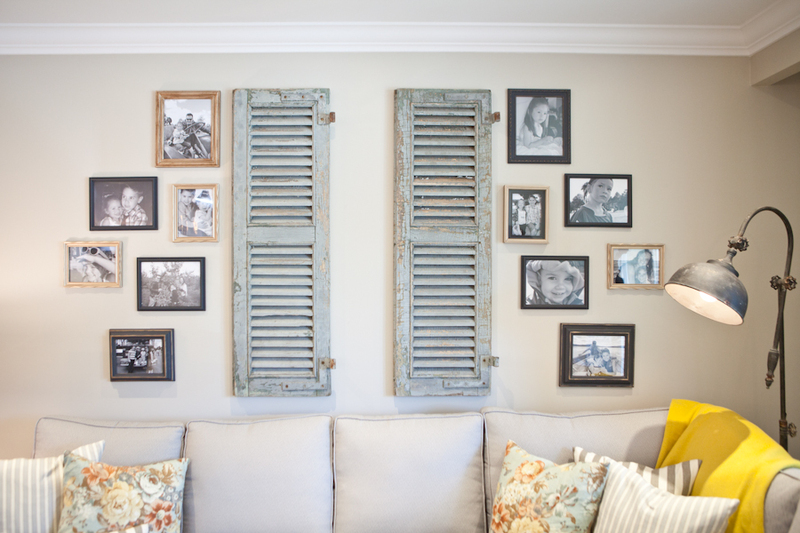 I also added a pair of vintage shutters which really add some drama to the wall. We used one of my go to suppliers for flooring, they are made in Quebec and this time I chose a beautiful maple hardwood floor. They are absolutely gorgeous they really give the space a lot of warmth and the tone is the perfect mix of dark and light which gives a rustic elegant feel. We carried the flooring throughout the main space and used a porcelain tile in the front hallway. 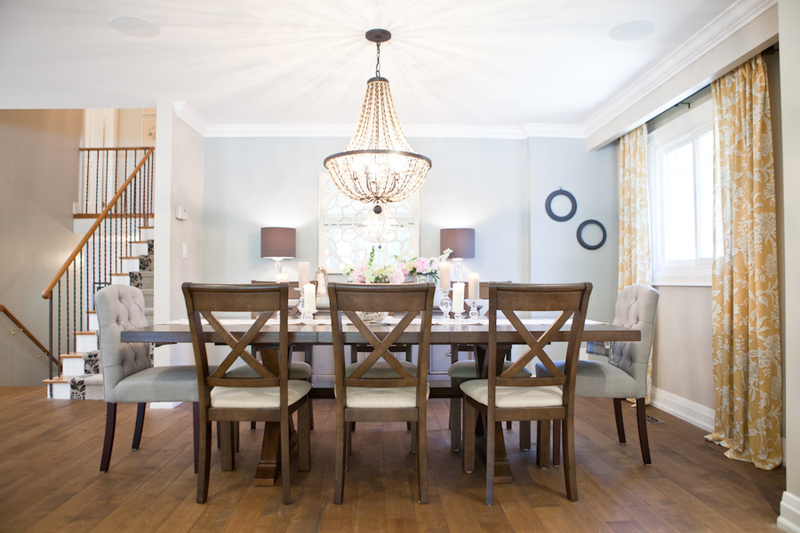 In the dining room we added a large dining table and custom linen tufted end chairs, I also chose a great vintage sideboard from Mango Reclaimed's inventory. I had her restyle it in a gorgeous warm grey and we decided to keep the original hardware as it was beautiful. 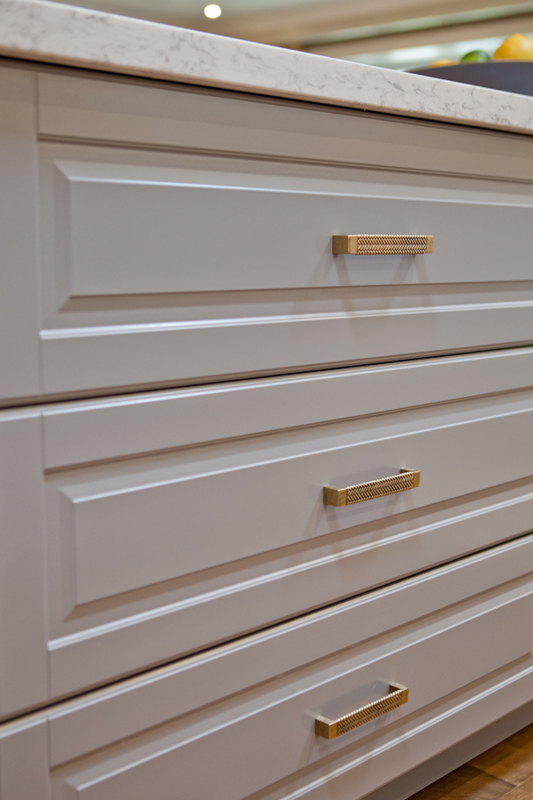 We just had her restyle the hardware in a custom mix of metallic paint to reflect the antique brass theme we had going on in the space already. We added a beautiful chandelier which is very pretty and reflects the light beautifully but still carries our theme of rustic elegance. We also renovated their main bathroom, I chose to carry the porcelain tile from the front hallway into their bathroom. We also added a double vanity to give them more functional counter and storage space. 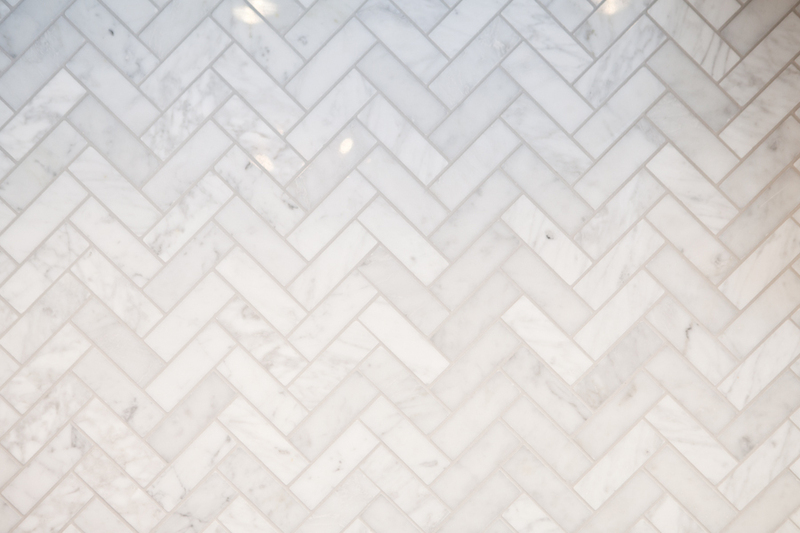 We tiled the shower in a white beveled edge subway tile and added a band of marble oval mosaic tile to add some elegance. We decided to create a half wall in the shower and then added glass to carry it to the ceiling to allow in natural light. 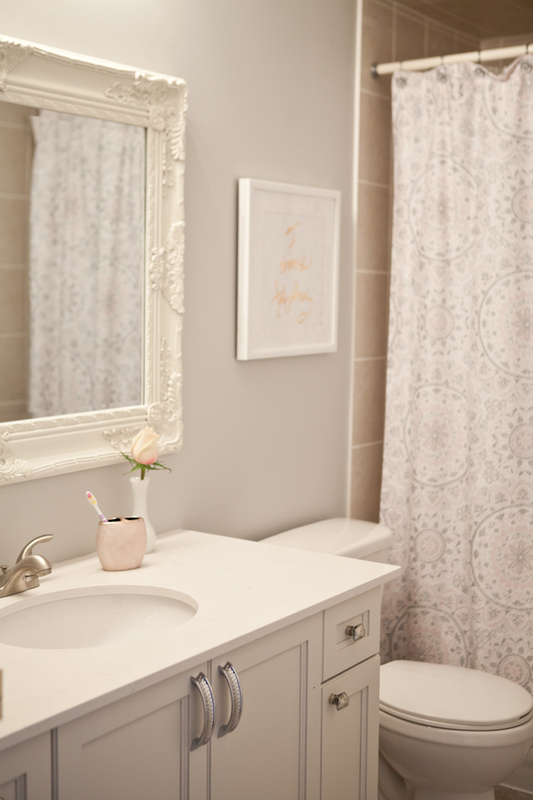 I pulled this beautiful bathroom together with some beautiful sconces flagging our new scalloped edged mirrors , light blue grey paint on the walls and some antique prints to finish it off. I hoped you enjoyed this reveal as much as I enjoyed sharing it with you all! As always we'd love to hear what you think about this one, so feel free to comment below and\or send us an email. Be sure to follow us on Pinterest, Instagram and Facebook or go to our blog or portfolio to see more of our work!! I am not going to lie, I'm not supposed to have favourites but this is my favorite reveal to date! The minute I met my client Kelly, I was super excited as I knew we could do something really feminine and soft and just like that my wheels started turning. I love taking my visions for a space and bringing them to life and nothing makes me happier than seeing my clients smile and hearing how much they are enjoying their new spaces. 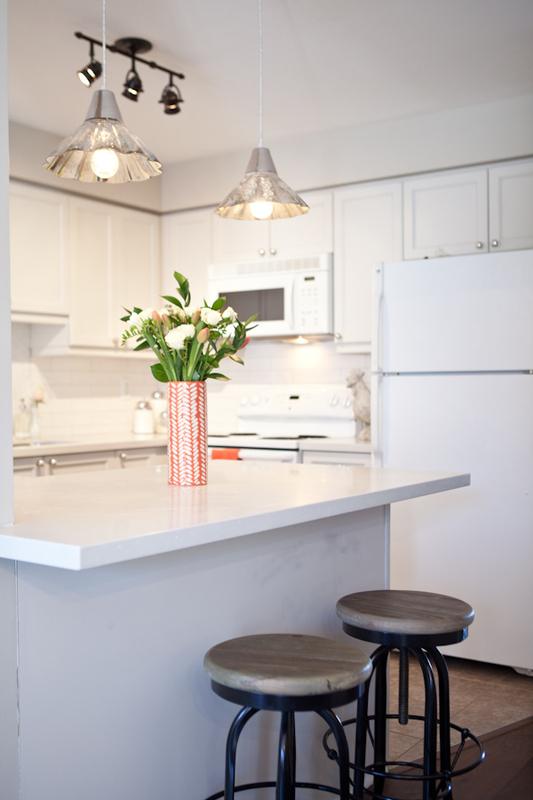 We started out with a total bachelor pad and turned it into a very sophiscated, girly glam space. Here are a few pics of the space before we started our girly glam reno! After viewing the space and meeting with Kelly, I was excited to get started. From the moment she told me she wanted a really feminine space, immediately I thought of creams, warm soft greys, hits of gold and silver and pops of coral. 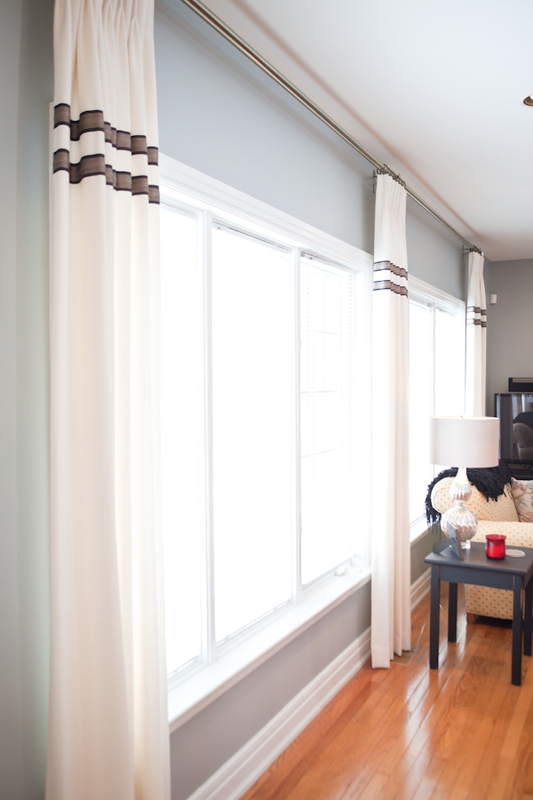 We started off by having the entire house painted in shades of soft grey. 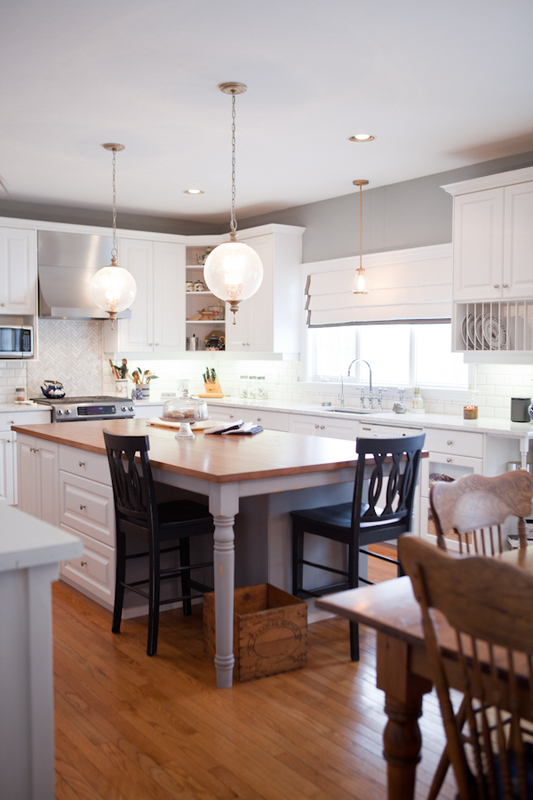 We had the kitchen & bathroom cabinents sprayed out in warm light greige tone. Even though they are light and soft, they still have depth. 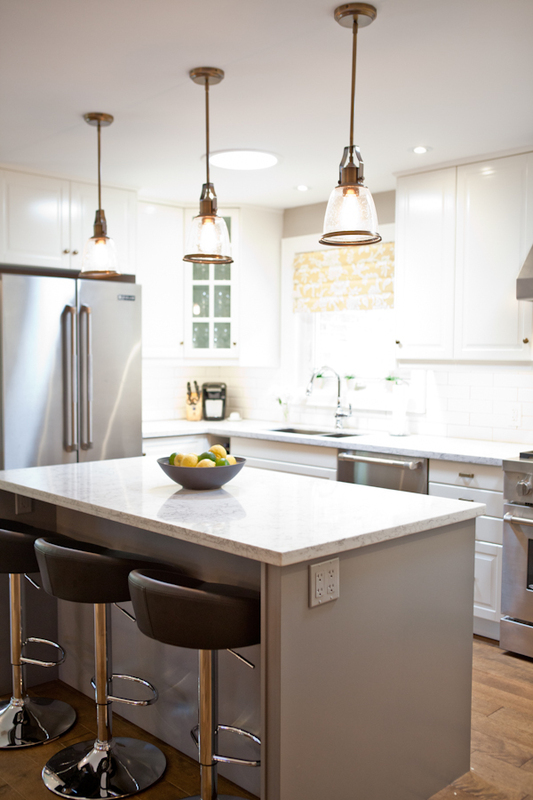 The colour really sets off the new cesarstone countertops & beautiful backsplash. The backsplash is a stunner, we did a long textured subway tile and an accent wall in the most beautiful abalone pearl penny tile! 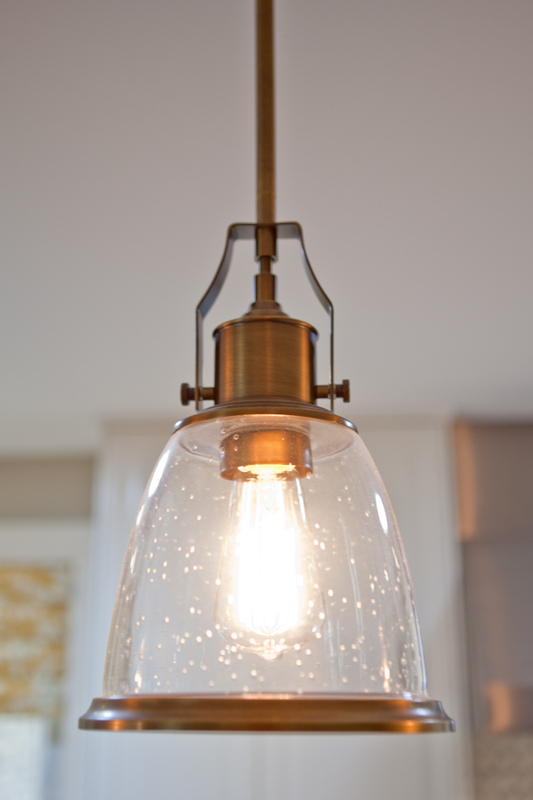 We also added new hardware and pendant lighting, which just pulls it all together! In her living room we really went with it -you'll see hits of brass and silver and pops of coral tones. 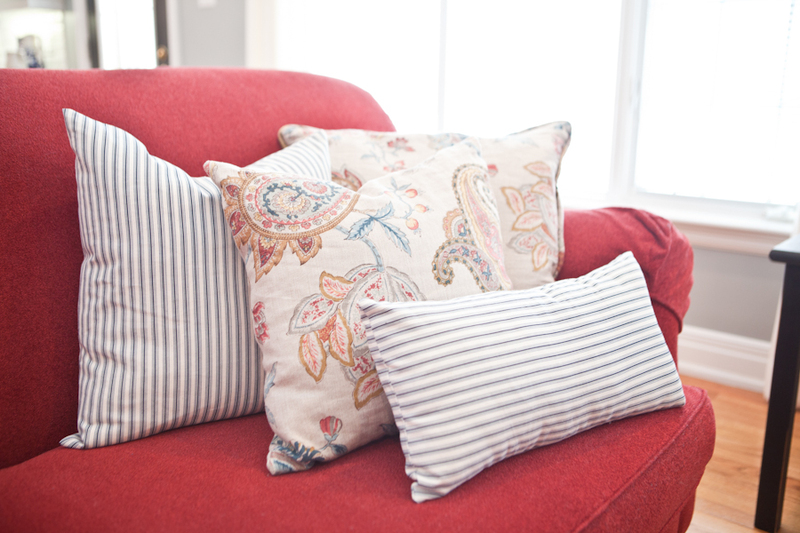 I think it just looks gorgeous, we chose beautiful fabrics for throw pillows which really ties it all together. The drapes really pop and frame the room. The new cream slip chairs and brass coffee table really add some interest to the space. I love mixing metals together, so don't be afraid to try it in your space as you can see from the pictures below they really look great together. We had Mango Reclaimed restyle her amoire, dining table & dining chairs in our coral, cream and grey palette with Miss Mustard Seed's milk paint and I think you'll agree they look absolutely stunning. We also updated the powder room and main bathroom as well. The powder room really reflects the color scheme of the main floor, we added a new sink & faucet, cesarstone countertops and new hardware. Along with a new mirror and accessories I think it is now a super cute space. We also updated the main bathroom which is mainly used by our client's daughter she wanted a soft pink and grey pallet. 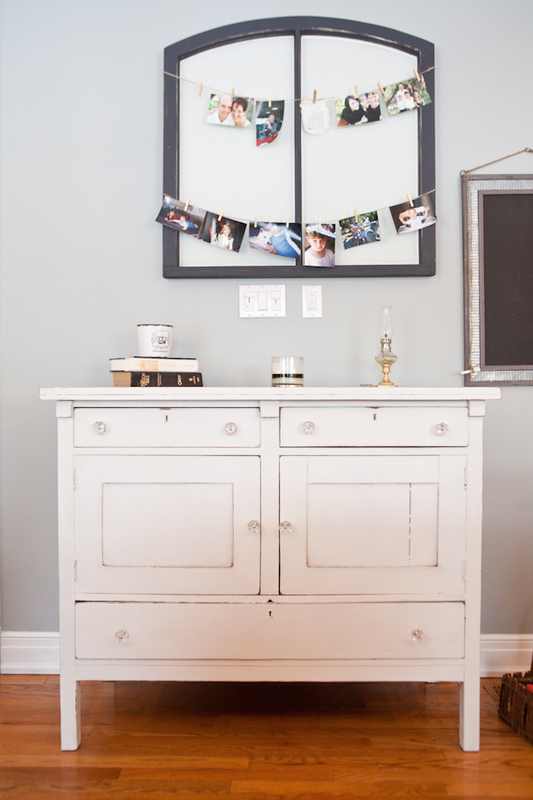 We used greys, creamy whites and soft pinks in both her bedroom and bathroom. We opted for a marble looking cesarstone countertop and sprayed out the cabinents in warm light colour and added new hardware and a gorgeous new mirror to pull it all together. 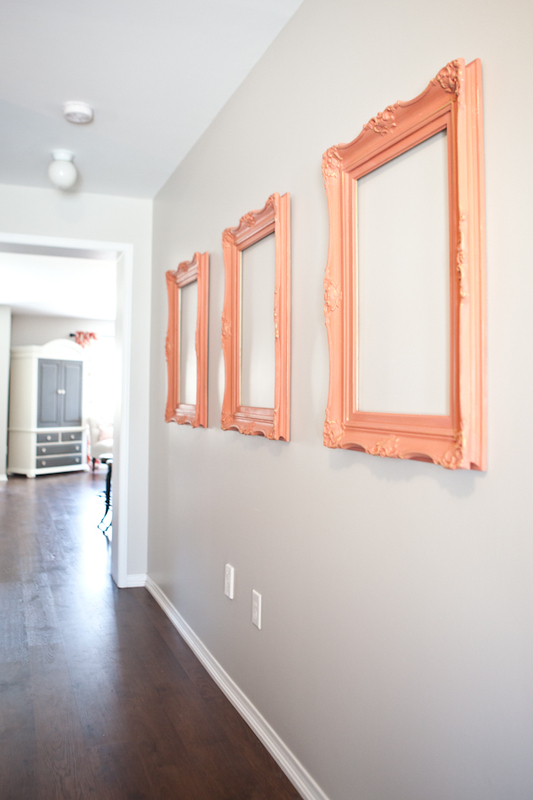 To tie it all together, in the hallway we added some vintage frames that were restyled by Mango Reclaimed in a beautiful coral color and metallic gold guilding paste was added to give them some glam and depth. We utilized the clients exsisting table and added a beautiful lamp and some accessories to add some storage and interest in the hallway. I absolutely adore this space and wouldn't mind living there myself... You don't mind if I move in with you Kelly do you? I hope you all enjoyed this tour of our latest project as much I enjoyed sharing it with you all. As always I'd love to hear what you think so send us an email or leave a comment below!! 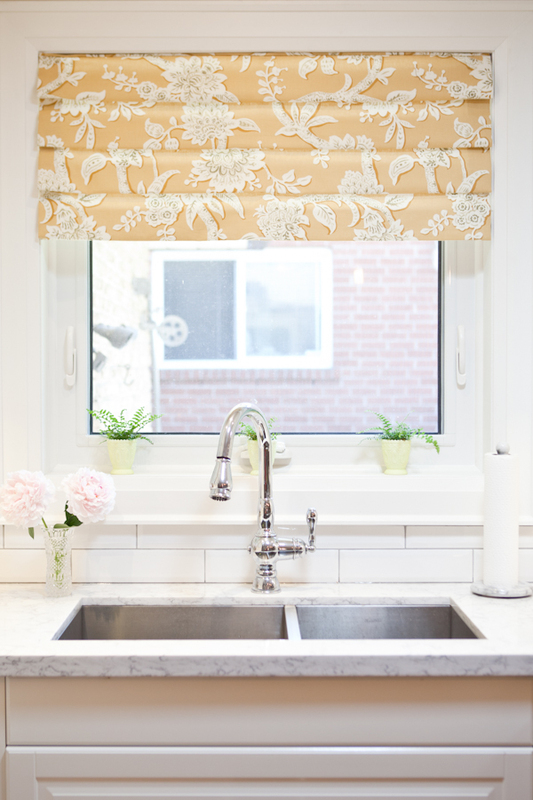 I know I have been promising to share this amazing kitchen and family room reveal since Christmas time, so here it is finally and I think you'll agree it really did turn out beautifully! We were lucky with this beautiful home as it had great bones already to work with. So we started with painting the walls a warm blue grey colour that would really make the white cabinets pop. We used hits of grey and black in the furniture and accessories as accent colours. Check out the old window frame turned into a clip board for photos, that we had Mango Reclaimed create this for us. We also stained the butcher block island in warm rich tone to make it stand out against the lovely new countertops. 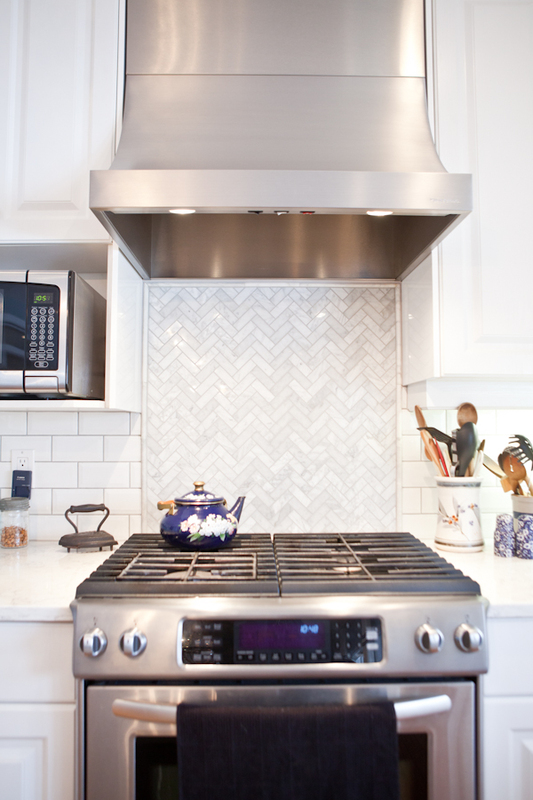 We added a white beveled edge subway tile and decided to add a marble mosaic herringbone feature wall behind the stove for some interest and drama. I also added a new custom hood fan that not only looks beautiful but is also very functional as well. The countertops are made by LG and they are absolutely stunning, they have the look of a warm marble but are scratch and stain resistant perfect for a family five! 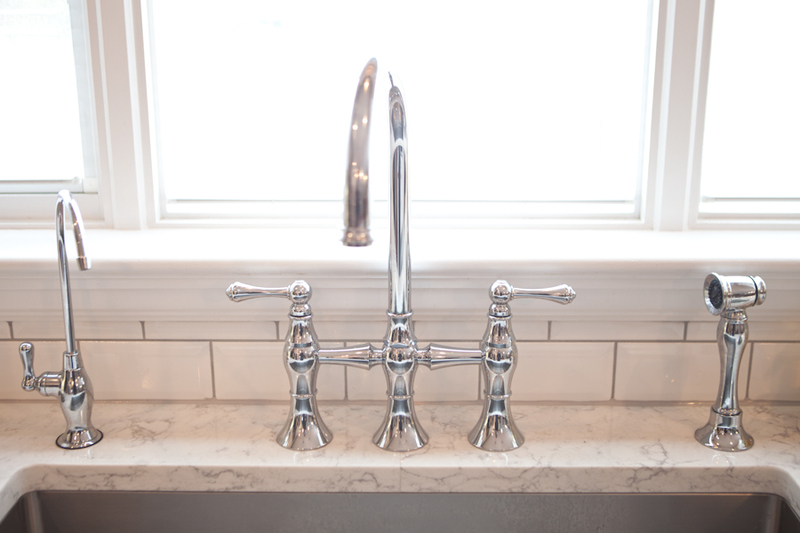 One of the other show stoppers in this kitchen is the bridge faucet-it is simply amazing! 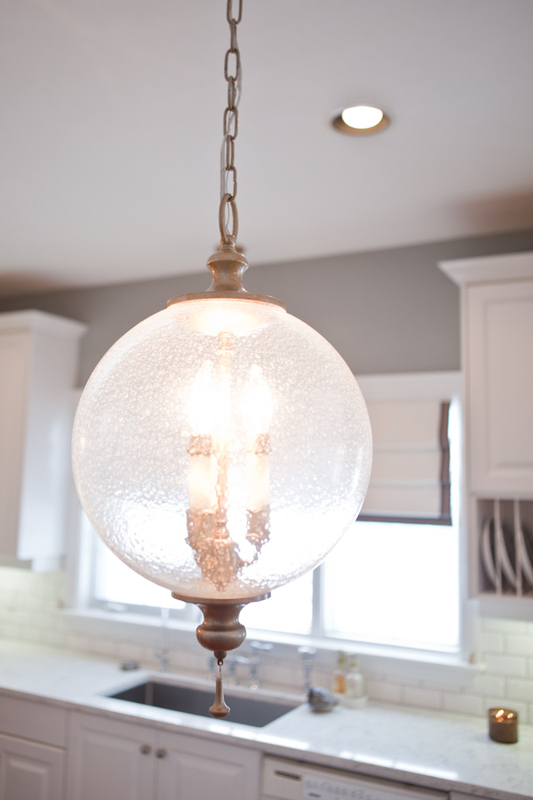 Lighting was also key in this home and we went for it! I fell in love with these lights the instant I saw them... I think they just tie everything together. 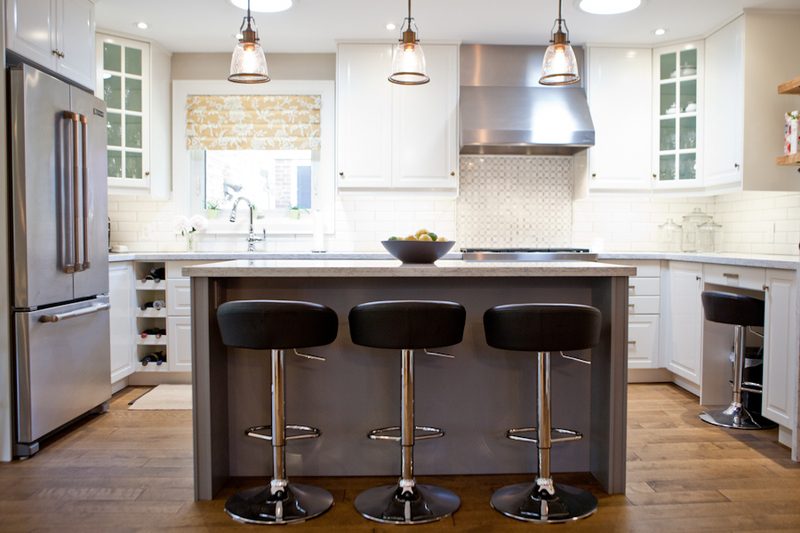 We added antique brass pendants over the island and a smaller one over the kitchen sink. 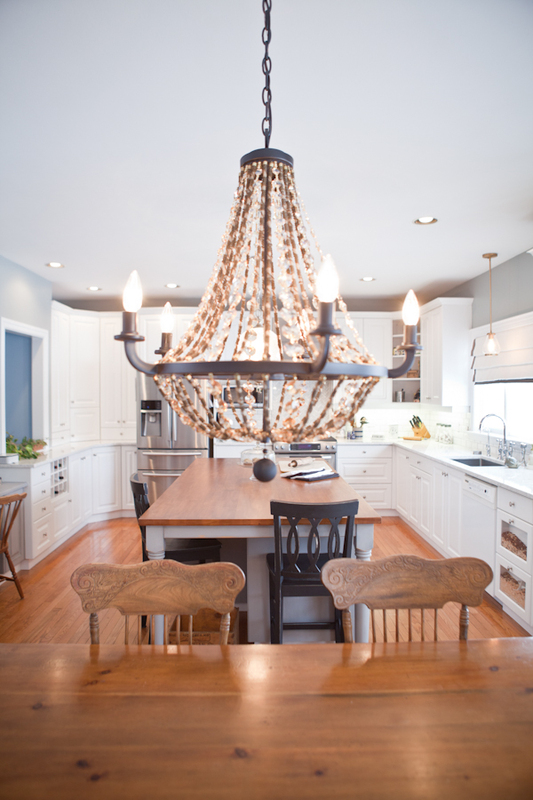 Over the family dining table we went rustic elegance and this understated chandlier just says it all. In the hallways we went for oversized pendants finished in a detailed matte black. We also painted out the inside of the front door and the garden door a soft charcoal black. I also had my client paint out her fireplace and some of her existing furniture with van gogh chalk based paint from Mango Reclaimed in Whitby. I think she did an amazing job and it really pulls the look together. We added custom draperies, new lamps, a rustic mirror over the fireplace and some custom throw pillows to tie it all together! I hope you enjoyed this reveal as much as I enjoyed working on it and sharing it with you! As always I'd love to hear what you think so feel free to email us or comment on our blog. We have some gorgeous new reveals coming soon.. so stay tuned and check back frequently for new photos and blogs! !